Located in the desirable Foxmoor Community in Winter Springs! 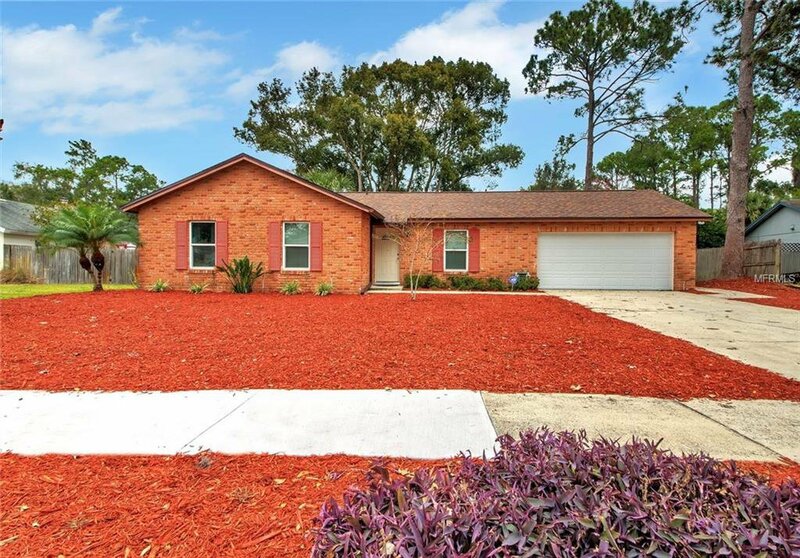 This MOVE-IN ready 4 BEDROOM, 2 BATHROOM home is a dream property. NO HOA! Red brick exterior and freshly mulched front yard for low maintenance. Main areas and all bedrooms feature LAMINATE WOOD FLOORING. FRESHLY PAINTED INTERIOR AND EXTERIOR. Just steps from the entry, you will notice the FORMAL LIVING and DINING area all with vaulted ceilings. The KITCHEN overlooks the DINING ROOM and Sliding glass doors with access to the LARGE 42X12 foot ENCLOSED/SCREENED IN PORCH that leads out to the LARGE BACK YARD with NO REAR NEIGHBORS. The large OWNER'S SUITE also has a Vaulted Ceiling and a LARGE WALK-IN CLOSET. The OWNER'S ENSUITE BATHROOM has a Walk-IN Shower. The 2ND BATHROOM FEATURES TUB SHOWER COMBO and services THE THREE ADDITIONAL BEDROOMS. Roof was replaced in 2016. Triple Paned Windows and Laminate Wood Floors installed in 2016. Water Heater and Stove replaced in 2017. Both Bathrooms remodeled in 2010. This home also features an attached LARGE SHED (10x12) for additional storage. Located near top rated schools, excellent shopping and restaurants nearby, and easy access to major highways, Winter Springs Town Center, UCF, Siemens, Lockheed Martin, and other employers. Nicely maintained community with PARK, PLAYGROUND and BASKETBALL COURTS located nearby. Listing courtesy of WATSON REALTY CORP. Selling Office: COLDWELL BANKER RESIDENTIAL RE.